Which quantities for my recipe ? Scale your recipe for as many servings as you want ! (none) \ngozlb \nclfl ozcup \nteasp.tablesp. You like this tool ? Share it ! How to convert my quantities for more or less servings ? Recipes to do for more or less guests? Adjust the quantities! The site MyKitchen makes it possible to realize its recipes by adapting the quantities of ingredients to the number of wished portions. The input of the ingredients is very convenient, it is assisted via a food base that also allows to consult the main nutrients. This converter makes it easy to adapt quantities of ingredients of a recipe to a number of different guests. How to calculate the right proportions? For example, you have a recipe for 4 servings and you need it for 6 or 9 people (like making bread?). How to adjust the quantities and then measure the right weights and volumes? First of all, you have to indicate the number of portions provided by the original recipe, at the top left. Then enter the desired number of shares in the box on the right. First enter the quantity (weight or volume) in the red box. This is a numeric value only! The following box is used to enter the name of the food. Although optional, this information allows in some cases to go from a unit of mass to a unit of volume when the density of the ingredient is known. The new quantity is immediately visible in the green box on the right! That's all, and now, to your cookbooks and stoves! 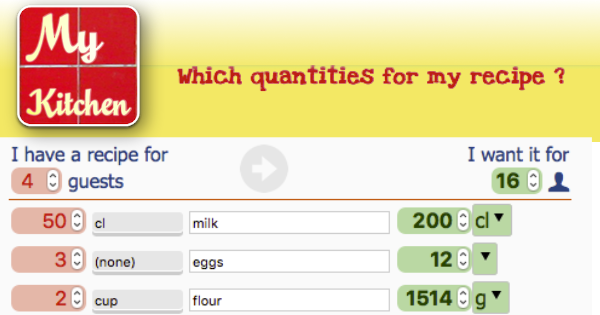 If you realize that you finally have an ingredient in smaller quantities than needed (eg need 3 eggs, but you have only two left in the fridge) you can then correct the result (in green boxes): it recalculates others ingredients quantities and indicates the new number of servings! MyKitchen is an assistant that will help you to scale your recipes ingredients needs to whatever the number of your guests. How to scale my recipes? Also get MyKitchen on your Smartphone (iOS or Android), this site is optimized !